Here at Intuitive and Email Tarot Reading, we give all our Tarot Reading by email. We prefer using this private format, which enables us to deliver a comprehensive, detailed Tarot Reading, complete with pictures of the cards we have drawn for you, straight into your inbox. So, as well benefiting immediately from Tarot Reading Wisdom and Guidance, you will have a copy of your Email Tarot Reading, to refer back to at any time you wish to, in the future. You can ask for a Tarot Reading about anything that concerns you, be it to do with Love, Family, Career, Health or Spirituality. If you are experiencing difficulty, doubt, or confusion your your life, we will do our very best to help you, for everyone needs a little help from the outside sometimes. ‘I an an Intuitive Empath and Tarot Reader and I love to help people with their problems. I worked as a Tarot Reader on phone and chat lines for many years, before setting up this Website in 2010′. 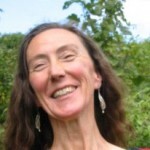 …….read more about Intuitive Empath Gillian here. ‘Gillian’s readings are the best I’ve had. Her insight is so valuable and the care and attention she gives to each reading delivers a concise, informative and clear take away that I’ve not seen elsewhere.’ Read more of Gillian’s Testimonials here. ‘I am a Psychic-Medium prepared to give you the advice you need to resolve any issue. I have been reading Tarot Cards for over 20 years’…..read more about Psychic-Medium Selena here. ‘This reading really helped me recognize the situation I was dealing with, and gave me wonderful food for thought which helped me to get through it. She is a very gifted and sincere reader, which in this day and age is a blessing. Thank you, Selena!’ Read more of Selena’s Testimonials here. Click here to Order an Email Tarot Reading from Psychic-Medium Selena. Develop your own intuitive powers, learn how to be an Intuitive Empath, develop your Psychic Abilities; click here to subscribe to the bi-monthly Intuition Development Newsletter ‘INTUITIVE’. Each subscriber is automatically entered into a draw for a Tarot Reading, the winner will be announced in the next Intuition Development Newsletter. Many of the posts on this site contain intuition exercises. Very many thanks to Holly Colino for writing this Guest Post about the Three of Pentacles and Interpersonal Intelligence; goal management, application of skills and teamwork. The Three of Pentacles either suggests great Interpersonal, Intrapersonal Skills or both, needed in order to attain a goal.Since The Tarot can be applied any way your cognitive process wishes to apply it, I have chosen to apply the Tarot for use of personal philosophical counsel. I will break down some main objectives to assess with the psyche. These objectives pertain to the manifestation of working in a group for a common goal or applying ones self with diligence to attain a goal. The amount of collaboration needed, the ability to cooperate in a group and ability to prevent issues from arising starts with Intrapersonal Intelligence. The ability to honestly assess yourself and be in the knowing of how you are receptive to stimuli and specific social arrangements will enable you to establish proper boundaries and to communicate your concerns within a group more effectively. By effectively communicating your concerns, ideas, own strengths and weaknesses, you will prevent misunderstanding and mixed emotions within a group. Intrapersonal Intelligence then assists you with attaining empathy and Interpersonal intelligence by understanding your own psychological dispositions. By sustaining a strong level of self awareness of your own cognitive influences which affect your perception and receptivity to the group, you can then apply Interpersonal Intelligence. If you have taken an honest and practical approach to your own self assessment, it is inevitable that you will be able to apply that process to another individual within the group. By understanding how to draw out the concerns of others and assist them with effectively communicating their thoughts, you can develop the best strategy for delegating and assigning tasks to each member of the group. You can ensure that each member is working on a task and in a manner that will enrich them, challenge them, be attainable, trigger their motive, appeal to their learning style and instill cognitive development. With Intrapersonal and Interpersonal Intelligence, a team can achieve cooperation, success and evenhanded applications of effort. 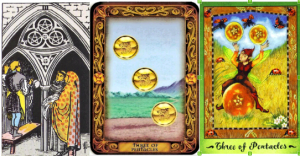 I very much hope you have enjoyed reading this Guest Post about the Three of Pentacles and Interpersonal Intelligence by Holly Colin0.